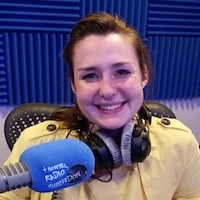 Hi, I'm Mhairi, and I've been volunteering at Radio Hillingdon since 2006, when I was 16. I started volunteering to complete hours needed to gain my Queen's Award, and was quickly hooked! I began doing a show with John Stanley (Tuesday's 7-8.30! ), and floated in and out of shows whilst I was at university, and once I graduated, came back to help host a request show. It was there I met my partner in crime, Gavin Chessum. After a 6 month stint in South Africa, I returned to get up to all sorts of mischief initially with Gavin every Tuesday between 5:00pm and 7:00pm but I've now returned to the 7:00pm to 8:30pm slot rejoining John Stanley on the Early Evening Show.